VW showed a teaser for its new crossover at its annual press conference. WOLFSBURG -- Volkswagen will export a new compact SUV/crossover, internally called the "Volks-SUV" or People's SUV, from Mexico to the U.S., VW brand CEO Herbert Diess said. 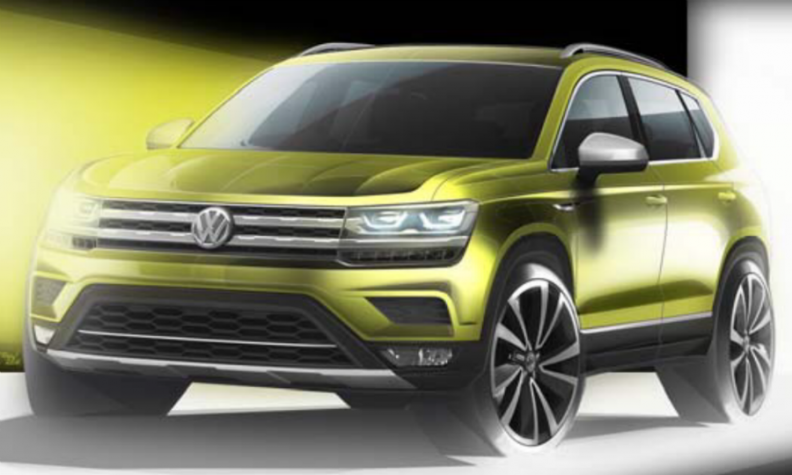 VW will position the crossover below the Tiguan. It is aimed at global markets except Europe where the T-Roc fills a space below the Tiguan. The goal is to sell 400,000 globally a year, Diess said on Wednesday at a press conference at VW's headquarters in Wolfsburg. Diess said the crossover will be a global model to meet growing demand for smaller SUVs and crossovers and also to help the company to comply with increasingly tougher CO2 emissions targets regulators are imposing on automakers in many markets. It will be built first in China by the SAIC-VW joint venture with Chinese sales beginning in August. Starting in 2020, the vehicle’s production footprint will be expanded to include Mexico, Russia and Argentina. "We will supply the U.S. from Mexico," Diess said. He gave no timeline on U.S. sales. VW brand sales chief Juergen Stackmann said the crossover is slightly more compact than the Tiguan. "We call it internally Volks-SUV - the production car won't have that name - because it turned from a regional project into a global project," he said. VW approved the SUV's design last week. It will based on VW’s flexible MQB architecture for front tranverse engine cars. VW executives said there are currently no plans to sell the SUV in Europe where the compact T-Roc better suits tastes in the region because it has smaller dimensions and a lower roof that gives it a sportier look. The SUV will be the first China-developed car sold by VW outside of the country. The midsize Phideon launched in China in 2016. It was later considered for global sales but VW decided there would not be enough demand to justify adapting the sedan to comply with U.S. rules, such as different crash regulations. Already China is influencing automakers’ strategy. Two-seat convertibles and coupes have lost their significance for VW and many automakers because Chinese buyers don't buy such models which are unsuitable for the country's heavily polluted cities. Mercedes-Benz designed its current S-class sedan from the outset as a long-wheel base version given half of the model’s volumes are sold in China. More recently, VW gave its upcoming Touareg a prominent grille covered in chrome to satisfy Chinese customers that did not believe the brand’s more low-key designs sufficiently expressed their status. VW brand is intensifying a push into the lucrative and fast-growing SUV category. It will widen its SUV lineup to 20 models by 2020 and expects those vehicles to account for 40 percent of sales volume by then. It will unveil an updated version of its flagship Touareg SUV in China next week. A new subcompact model dubbed T-Cross will be added in Europe at the end of this year. “In almost all regions we will almost double our SUV offerings by 2020,” Diess said. The brand is relying on sales in the segment to generate the funds it needs to create electric vehicles and boost digital services that will reshape the marketplace over the coming decades. VW has culled slow-selling models such as the flopped Phaeton, the Scirocco compact coupe and the three-door version of the small Polo hatchback to rein in bloated expenses.